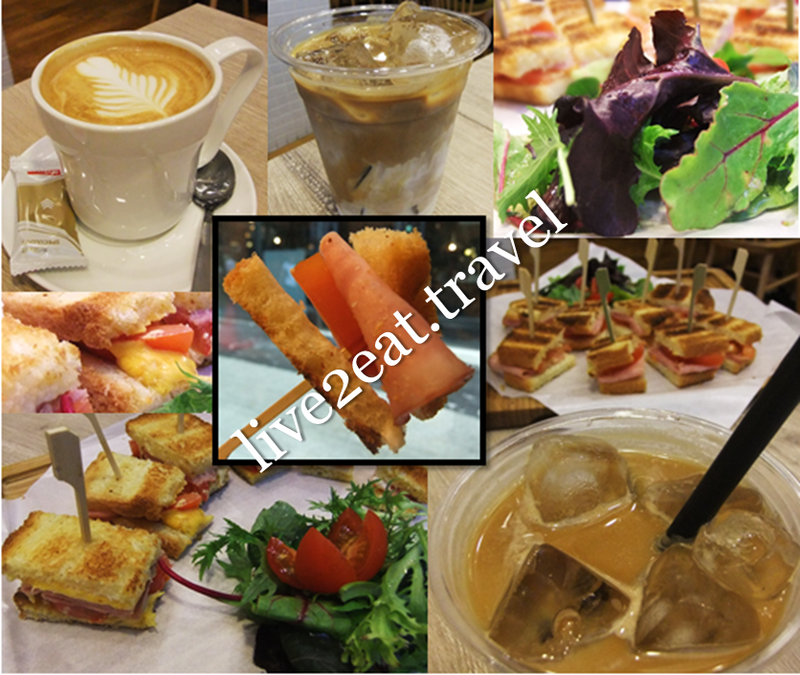 Last Saturday, I participated in Westgate Food Trail organised by Food & Travel magazine. While this was not my first time to the shopping mall beside Jem, I have never been to the 4th floor where we gathered at Westgate Wonderland, a themed play area. What I like about Westgate is its mix of tenants including the only Borders (Kinokuniya is in Jem) in Singapore, Isetan department store and supermarket as well as restaurants opening their first branch outside the heart of Singapore – MK Restaurants at 313@Somerset and Ippudo with presence at Mandarin Gallery, Mohamed Sultan and Asia Square. Nara Thai Cuisine, with a branch at Ion Orchard, will open next week. CapitaLand vouchers can be used here or at nearby IMM and JCube. Started at Café Crema, an Italian-inspired café offering espresso-based drinks made from 100% Arabica beans roasted by Highlander Coffee. Other than fine coffee passionately and skilfully handcrafted upon order by cheerful and experienced barista, items on the menu include pastas and artisan gourmet sandwiches choc-a-bloc with good quality ingredients such as Big Bad Wolf – breaded pork cutlet, smoked ham and crispy bacon. 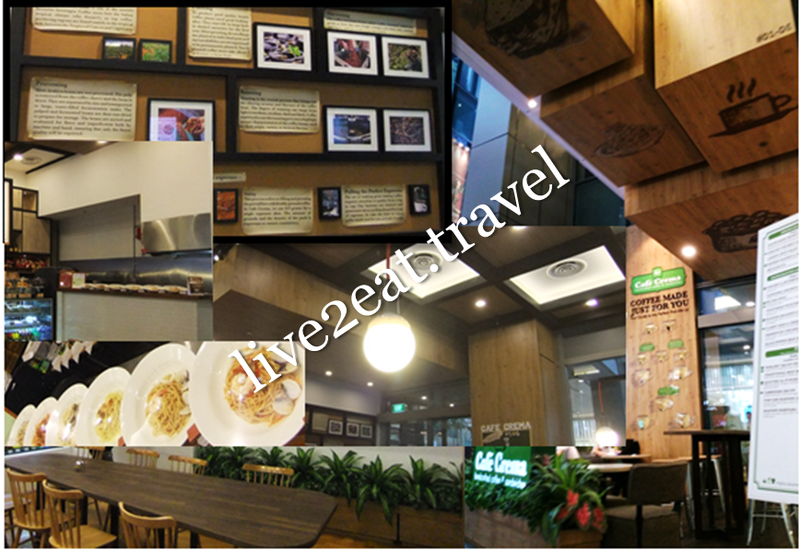 Located at the courtyard beside Paul, this is its 2nd branch after Gardens by the Bay. It is part of the Shin Group which includes four branches of Shin Kushiya (including Jem and VivoCity), Kiraku at Market Street and Veranda at Gardens by the Bay. From the outside, its green logo stood out against lots of wood with blocks of varying thickness above the entrance. Between the entrance and all-glass frontage were seats perfect for people-watching, or "to see, and be seen". More wood could be seen inside with the same wooden tables and chairs, flooring and planters. Wooden frames on one wall had pictures with description from the planting and harvesting, processing and roasting of coffee beans to pulling the perfect espresso. The place feels spacious with high ceiling, white walls and white tiles below the wooden counter tops. We were treated to bite-sized (not the usual way it is presented) Classic Ham and Cheese served with fresh greens in a light, sweet and tart dressing on the side. Could neither rave about nor fault the grilled buttery brioche with smoked ham, mozzarella and red cheddar. There was nothing that could not be replicated at home, except maybe for its in-house special dressing. Preferred the hot to iced almond latte with a nice aroma of roasted beans and taste of almond in the foam, unlike the cold cuppa where almond was at best a faint aftertaste on the tongue. Both were smooth and bitter but not thick enough. Our 2nd stop was to Zaffron Kitchen, also at the courtyard with seats between its grey entrance and all-glass frontage. With the same high ceiling, it is located beside Miam Miam and has another branch along East Coast Road. Two chandeliers hanging from the ceiling, marble table and counter tops added extravagant touches to wooden chairs and picture frames on brick walls interspersed with wooden panels. 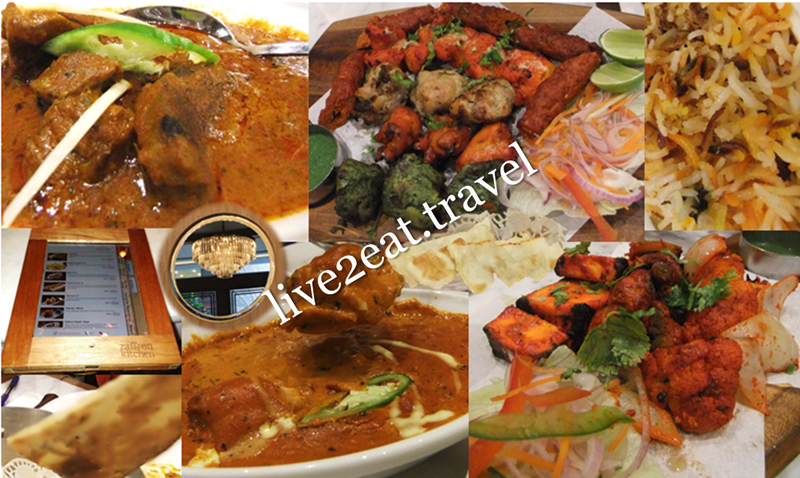 Atypical of Indian restaurant, it offers 1-for-1 beer and snack bar menu as well as weekday lunch sets and afternoon tea on weekends. Interestingly, its menus are iPads locked inside custom-made wooden blocks. Preferred the Non-Vegetarian Tandoori Mixed Grill to the Vegetarian Tandoori Mixed Grill, and found its Butter Chicken a tad sweet. Gravy of both the latter and Mutton Rogan Josh were perfect as dips for the Plain Naan, which was better than its Basmati Biryani Rice and Plain Rice. Meats were tender and mutton not so gamely that I found unpalatable. 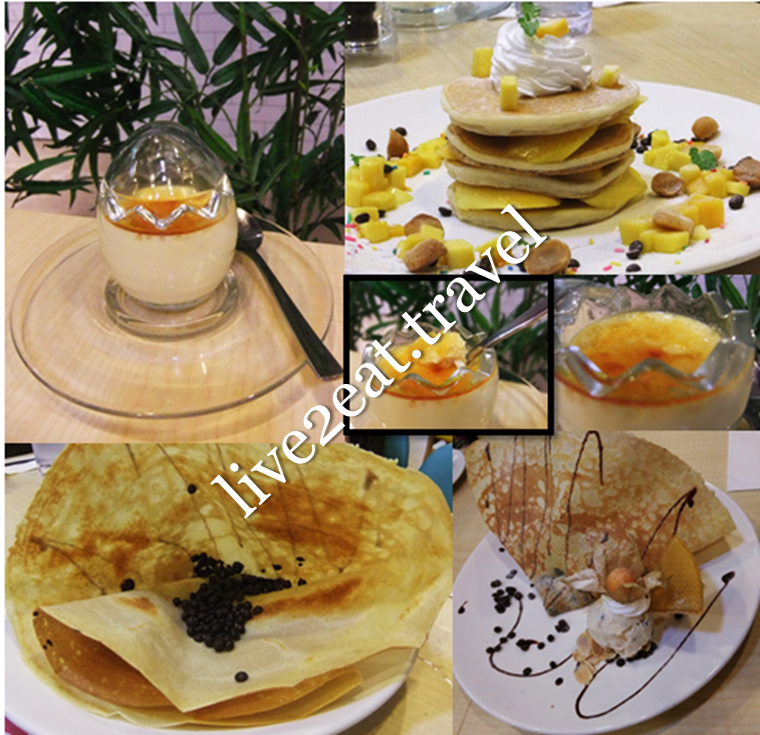 By now, most of us were full so we rested a while before proceeding to Eggs & Berries on the 2nd floor. 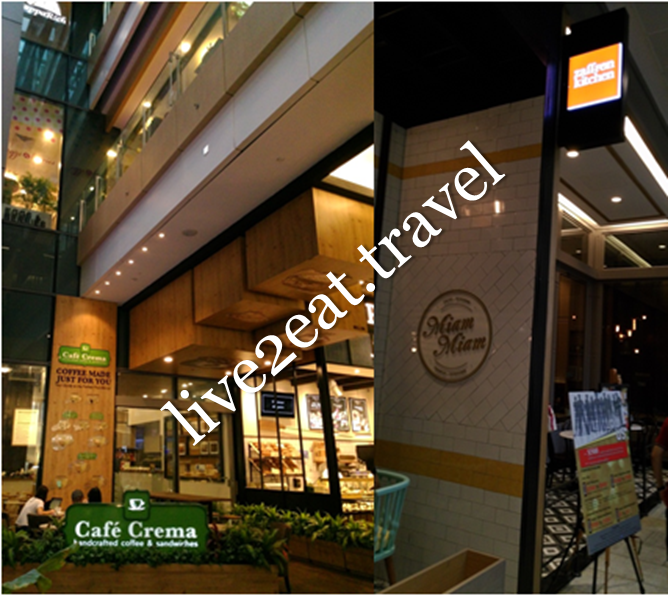 Located above Café Crema, this is its 2nd branch after Changi City Point. Some have a separate stomach space for desserts but I am unfortunately not one of them and gave the Homemade Crème Brulée a miss. Mango Tango had four pieces of pancakes with mango slices in between and cubes scattered all over, topped with whipped cream. On the plate were also roasted macadamia nuts I happily relished, chocolate chips and rainbow sprinkles. Over the Rainbow waffle – medley of fresh fruits and roasted nuts, topped with whipped cream and gooseberry, was not served to our table. Instead, we had Devil's Chocolate which came with chocolate chips and pearls inside the crispy crêpe. By the side was a scoop of chocolate chip cookie dough ice-cream (topped with whipped cream and gooseberry too) with almond flakes, more chocolate chips and pearls. All four are their signature dishes. Update: The Café Crema branch at Westgate has closed.